West Indies started the third day trailing by 555 runs with 4 wickets in hand in their first innings. They added only 87 runs to their overnight score and gave India a lead of 468. Virat Kohli soon put the West Indies again into bat to follow on. Roston Chase and Keemo Paul did provide some entertainment for the Rajkot crowd with some clean hitting, but the mountain of runs that India added in the first innings was too much to climb. Ravichandran Ashwin took 4 wickets and was the pick of the bowlers in the first innings. In West Indies’ second innings, it was the turn of Kuldeep Yadav to shine. Kieran Powell played an attacking inning of 83 runs but Kuldeep’s maiden 5-wicket haul was enough for India to get an innings win in the bag. Kuldeep made up for his mistakes in the first innings where he was guilty of bowling too short, he gave much more flight in the second innings. Ashwin struck on the last ball before tea leaving India within 2 wickets of wrapping up the match in the 3rd session of the first Test’s 3rd day. West Indies finally folded for 196 giving India India a win by an innings and 272 runs. Kohli said that it was a team effort. He gave credit to the batsmen, especially Prithvi Shaw, for piling on runs and giving the bowlers a platform to put West Indies under pressure, which resulted in India’s biggest win in terms of runs. Brathwaite accepted the huge defeat and said that his team were totally outplayed in all three departments. According to him, this was not a rank turner where a team fails to score 200 in each innings. He highlighted the lack of application shown by his batsmen. 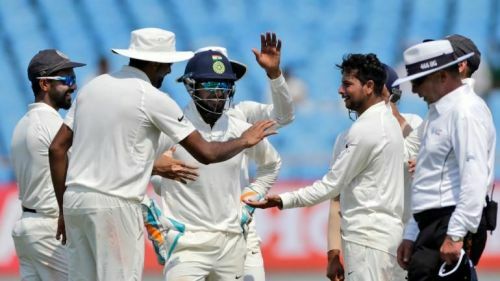 Kuldeep said that sometimes it takes time to adjust to the wicket and he was guilty of bowling too full in the first innings, but he rectified it in the second innings. Cricket expert Ayaz Memon also wrote about the state West Indian cricket is in right now. He reminded us of the legends of the game West Indies has given us. Headley, 3 Ws, Sobers, Kanhai, Hunte, Lloyd, Butcher, Nurse, Viv, Greenidge, Haynes, Kalli, Fredericks, Rowe, Richardson,Lara, Hall, Griffith,Roberts, Marshall, Holding, Garner, Walsh, Ambrose, Ramadhin, Valentine, Gibbs, Gayle. What legacy, what a tragic slump for WI cricket! Gaurav Kalra also termed this West Indian side as complete mediocre one failing to give any fight in the first Test. Cricket experts also felt sorry for KL Rahul who was the only batsman who failed for India, and who then had to watch all other players have a great impact in the match. Another cricket expert pointed out R Ashwin’s ability to clean up the tail which has been an asset for India.